INDIANAPOLIS -- Rebecca Polanski has encouraged women to report sexual assaults, although criminal charges were not filed in her case in Marion County. Polanski of Indianapolis said she was raped this past September 9 during a date with a man she met on social media app. The graduate student went to the hospital to undergo a forensic exam and the case was investigated by police. After a review of the incident, the Marion County Prosecutor's Office declined in December to pursue charges against a 28 year-old man. "I was furious and kind of devastated especially being told there was no other way to bring criminal charges," said Polanski. 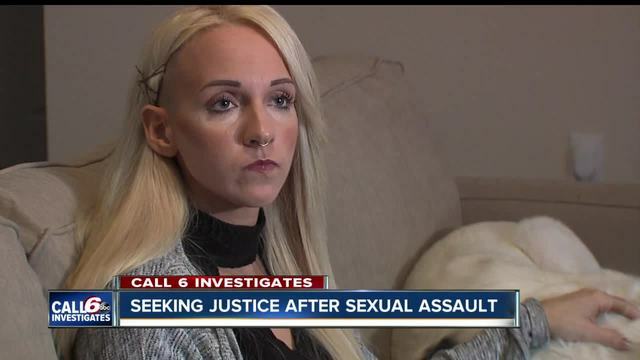 She’s considering filing a civil lawsuit to hold her attacker accountable and she’s filed a protective order against him. Call 6 Investigates has been made aware of his name, but will not identify him unless he’s charged with a crime. “I can confirm that the investigation regarding Ms. Polanski was referred to our office by law enforcement and that ultimately no charges were filed. This investigation was reviewed by multiple deputy prosecutors who reached a consensus on that decision based on the full investigation and evidence provided. We give each and every investigation attention and the utmost consideration. The assertions that our office was “unsure what to do” or that the case was not filed because deputy prosecutors “weren't positive we would win” are inaccurate in this and every matter. I do not know how that message was conveyed to Ms. Polanski, but it is unfortunate she feels our office was not able to help her. Unfortunately, there are cases involving every type of crime which may not be charged due to a variety of reasons. We do charge, prosecute, and take to trial very difficult cases each day. It would be inappropriate to provide any further information about this specific charging decision or the evidence provided beyond what Ms. Polanski has given to you. It is our sincere hope that she can understand our deputy prosecutors are devoted to serving justice and that we wish her nothing but the best in her recovery.